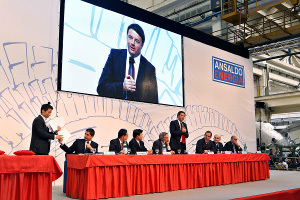 Shanghai Electric has agreed to acquire a 40% stake in Italian firm Ansaldo Energia for €400 million. The Chinese heavy engineering group will purchase the stake from Fondo Strategico Italiano (FSI), which acquired 85% of Ansaldo Energia from Finmeccanica and First Reserve in December. Shanghai Electric (SEC) and Ansaldo Energia (AEN) have also agreed to form joint ventures in China for manufacturing of gas turbines for Asian markets and the creation of an R&D centre in Shanghai. "The agreement with SEC will enable AEN to launch the development of a new gas turbine technology and to access Asian markets that are undergoing strong growth and represent 50% of the world market and expanding rapidly," says FSI. The deal is also expected to raise AEN's turnover by 20% in the medium-to-long-term, increase turbine manufacture in Genoa by 3-4 new units a year, and create up 500 new jobs, including 35 new AEN engineering positions. It could also represent a major benchmark of economic relations between China and Italy. The transaction is expected to close by the end of 2014, following approval by government and antitrust authorities. In related news, Ansaldo Energia has partnered with Korea's Doosan Heavy Industries to undertake R&D to develop a new gas turbine for countries with 60 Hz grid technologies (such as North America, Brazil, Saudi Arabia and South Korea). The project will receive partial financing from the South Korean government.